Vantium Schools provides schools (Primary and Secondary schools) everything they need for world class e-learning. Vantium Schools was built to address the challenges facing schools in Africa in implementing e-learning. These challenges include low power supply, poor and high cost Internet and high implementation cost of current e-learning options. These challenges is why Vantium Schools is a cost effective platform that has been built to work without Internet. View the video to see a demonstration of how Vantium Schools work. All of these don’t address the core of e-learning. The core of e-learning is using technology to individualize the teaching of the curriculum by differentiating instruction and assessment to meet the unique needs of each student with direct impact on student performance. This is why we have developed a full-fledged e-learning solution that is easy to use by students and teachers what ever their computer literacy level. It is adaptable in all class of schools irrespective of the school infrastructural inadequacies and e-readiness of the teachers. 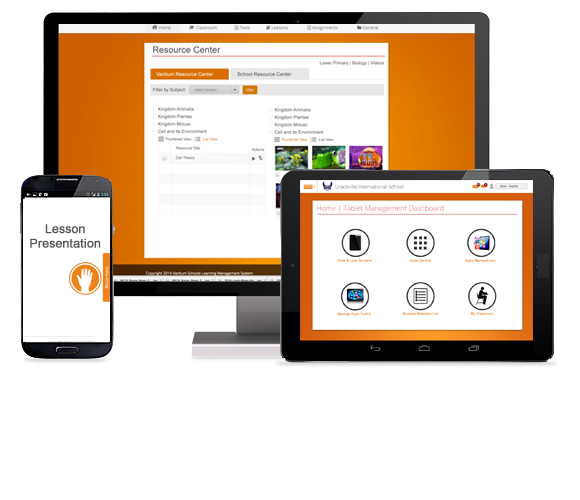 Our e-learning solution can be easily integrated with any type of curriculum; British, American, Nigerian or blended. Unlike many other solutions, Vantium Schools is focused on student understanding, classroom collaboration and efficiency for enhanced student performance not just school management and administration. Current mode of teaching requires that teachers makes sure every child in class is carried along within a fixed time period of 40 minutes. Teachers do not have the luxury of repeating a lesson until every child understand since they have course content that must be completed within a term period. Available time period is typically not enough to ensure that every student is carried along during a class period. With video notes students can now learn at their own pace by playing video many times to fully understand. Evaluation tests adminitered in every class which is automatically marked by system enables teachers to know right in class what students understand in every lesson taught. Elearning removes the manual work of marking and allows teachers concentrate on analysing data on student understanding to allow for differentiated instruction. They say a picture speaks louder than a thousand words. Videos even speak a lot more louder. Videos will help teachers reinforce concepts being taught in class rather than depending on pictures from textbook. A teacher teaching volcanos in clas can make it more real to his/her students with the use of videos. Currently we rely on teachers intution to keep track of students learning in class. At best learning information is locked in student notebooks which has limited use. By administering evaluation questions that are automatically marked by the system for every lesson taught e-learning makes it possible for teachers to keep life long data on student learning that can be used to improve student performance. For example if a teacher has 3 concepts to teach in class he can enter 5 evaluation questions that tests those concepts into the system which can be administered. At the end of the class he administers the questions and system automatically marks and give teachers result of test. Teacher can then identify which questions the entire class is struggling with and what each student does not know. Most schools currently generate their own electricity and is available for just administrative work in most schools. Classes are built to run without power. To implemet e-learning schools must make adequate provision for electricity which in turns adds to the unattractiveness of implementing e-learning. Most E-Learning solutions are web based and cannot be used in the classroom. For these solutions to be useful in the classroom, schools will have to invest in huge Internet bandwidth is expensive and unreliable making it an unattractive option for most schools. Teachers are the critical succes factors in the implementation of e-learning in any school. 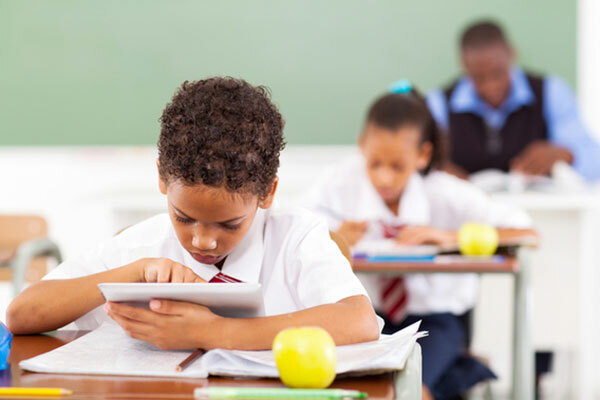 However most teachers in Africa currently do no have the requisite skills to use technology in the classroom. This therefore presents a huge challenge in successful implementation of e-learning in most schoools. Most schools ICT infrastructure is not more than a few computers in an ICT room. This makes transiting to a full fledged e-learning solution a huge project which is a huge cost that has discouraged a lot of school from starting their e-learning project. Designed to work within school without depending on the Internet, which makes the solution available on demand and eliminates huge bandwidth cost. Enables teachers to share big size document, video, audio files to multiple students for individual use. Enable teachers to develop their own curriculum aligned digital content. Filters inappropriate website automatically when students research online. Makes teachers accountable by providing a real-time view for schoolmanagement to measure students understanding based on teachers delivery in each classroom for every lesson taught. Enables CBT and theory based assessments to prepare students for new exam formats. Designed to conduct school wide objective and theory exams across several subjects. It incorporates writing on paper into e learning to preserve writing skills. Enable students to keep up with daily class work from anywhere in the world. Manage administrative, exams and curricular related documents centrally to cut printing cost. Allows the teacher to view student’s screens and control students tablets remotely in the classroom. Facilitates collaboration by Integrating seamlessly with class projector and smart board to project teacher or student(s) individual actions on their tablet pc for the whole class to see. The tablet has 3 modes, which makes it ideal to be used by students in school with control by the school, used at home with control by parents and used by adults with no limitation. Each tablet pc is track able with no room to hide for anyone that steals the device. We provide reference resource materials to aid the teacher for rich teaching experience. The Vantium Schools software will be installed on the server and each student will access the e-learning solution via Vantium educational tablet PCs. The tablet PCs for this e-learning solution are our brand of educational PCs called the Vantium Junior designed for education. The Vantium Junior will be used, as the learning workstation in classes and all the student data will be backed up on the server. Teachers can upload class content on the server and each student will be able to access and download it on their Vantium Junior tablet PCs. Our solution includes a webserver, which automatically backs up the local server periodically when there is Internet access and provides web access for students to keep up with daily class work from anywhere in the world and also provides information to parents. Vantium Schools enables teachers to measure student understanding for every lesson taught by providing instant feedback for every questions administered during the class. This feedback enables teachers to identify areas of weakness of every student to provide differentiated instructions to individualize the lessons. 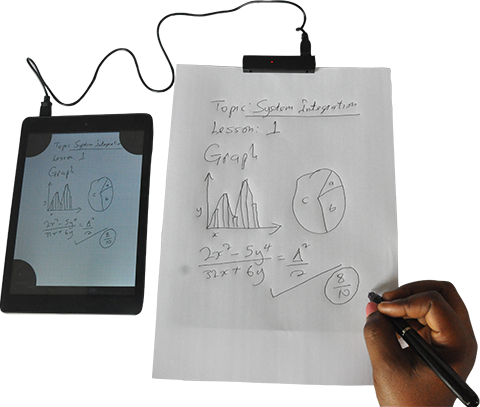 Students use Vantium Educational Tablet PCs to get their lesson notes, videos, tests and assignments. Tablet Management on the tablets puts the teacher in control of student activities in the classroom. Students now have access to their lessons digitally on their tablets in various formats which includes videos. With videos students can better understand concepts taught in class. Students can take assignments home on their tablets pc and submit offline and assignments is automatically submitted when student gets within school premises. Students can now take assessments on their tablet pc both in class and out of school without the internet. This rigorous assessments will help them student master concepts taught in class. Every lesson and assignment has a dedicated discussion board moderated by teacher which facilitates collaboration between students. This is useful when school is not in session and school must go on. Safe browser blocks inappropriate websites through our safe browser while doing their research online. Ability for teachers to administer evaluation questions in every class with useful analysis/feedback performance enables teachers to quickly spot the weaknesses of individual or group of students on every lesson taught. Teachers ability to install and uninstall apps remotely on student tablets put teachers in control of their class. Teachers can also launch apps remotely for all students in their classroom thereby ensuring all the class are doing the same thing in class. With Vantium Schools teachers can easily create their own video. With this functionality teachers need not worry on how student that miss class or fall behind in class catchup. Students can at their own spare time and pace watch these videos to catchup. Teachers can connect their Vantium Tablet PCs to class projectors, Smart/IP Boards for instructional purposes. This enables teachers to mobe around the class rather than being fixed to a spot in the classrom as in the case of laptops and desktop PCs. Teachers are in control of all devices used in the classroom. Teachers can view and block any student screen without leaving their position in class. 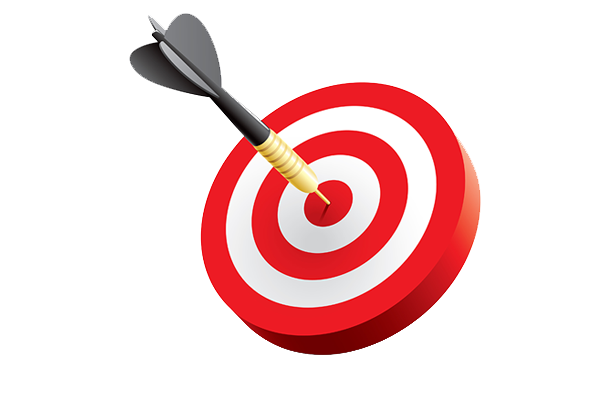 Teachers are critical success factors to the success of any e-learning project. Most teachers in our schools are not IT savvy. This means every e-learning project must be easy to use for teachers. Since writing is the skills that most teachers currently have, writing must be incorporated to e-learning to ensure mass adoption by our current crop of teachers. The Vantium Magic Pen incorporates writing into e-learning by helping teachers digitize what they write on any sheet of paper. The Vantium Magic Pen is a proprietary, easy to use technology that enables teachers to write on paper and let what is written to be automatically converted into it to a digital note. With this technology teachers can start creating digital notes without changing teir current skill set of just writing thereby ensuring that no teacher is left behind in the schools adoption of e-learning. With Vantium Schools the clasroom is no longer a black box. Access to Lesson Notes, Assignments, Test Scores allows School Management to assess the impact of their teacher in the classroom. This way school management are able to get involved with teachers to spot problem areas in the classroom quickly.